Provide comfort for the family of Daniel G. Spellman with a meaningful gesture of sympathy. 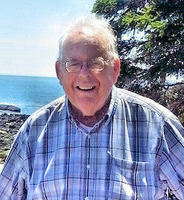 HAMPDEN – Daniel George Spellman, 82, passed away at his home April 3, 2019 surrounded by his family. He was born March 19, 1937 in Bangor, the son of Esther (Davenport) and Paul Spellman. Dan attended John Bapst High School and enlisted in the Marine Corps in 1954. He married Lois Ann (Pierce) Spellman in January, 1959. Following his service in the Marines, he attended Portland Jr College and went to work with his father at Spellman & Son Insurance. He later sold the family insurance business and embarked on a new career, opening a sunroom franchise in Bangor. Throughout his life, he was a very active in the Knights of Columbus, serving in many positions, including Grand Knight. Along with his wife, they volunteered at the Dorothea Dix Soup Kitchen for over 30 years. They were also very active in St. Paul the Apostle Parish, St. Matthew’s and St. Mary’s churches. Dan loved the outdoors, hunting, trapping and fishing with friends. He and Lois built a camp on Branch Lake that became a source of great enjoyment for family and friends. Along with his parents, he was predeceased by his infant daughter, Sara Maria. He is survived by his wife Lois; their daughters, Cheryl Pearson and her husband, Jon, of Merrimac, MA, Stacey Trembley and her husband, Keith of Orono, ME, and their son, Michael Spellman and his wife Frances, of South Salem, NY; their 10 grandchildren, Jared & his wife, Amanda, Elizabeth & Alex, Evan, Matthew, Timothy, Kathryn, Kristin, Thomas, Jonathan & Keira; 3 great grandchildren, Myles, Amelia & Braelynn; 4 sisters, Sharon Folster, Charlotte Present, Paulette Rideout & Michaeleen Bohan; his special in-laws, Phyllis Wilbur and her late husband, Paul of Hermon, ME, Nancy & Phillip Luttrell of Bangor, ME. In addition, we give thanks to his special friend, fishing & hunting partner, George Currier; caregiver, Tim MaGaw of Hampden, Visiting Angels of Bangor, CHCS’ Hospice Services and many family friends. A funeral Mass will be held 11 am, Tuesday, April 9, 2019 at St. Paul the Apostle Parish, St. Matthew’s Catholic Church, 70 Western Avenue, Hampden. The family invites family and friends to share memories, conversation and refreshments in the church hall following the service, Tuesday. Those who wish to remember Dan in a special way may make gifts in his memory to the Maine Parkinson’s Society, Support Group of Bangor, 146 Parkway South, Brewer, ME 04412. Condolences to the family may be expressed at BrookingsSmith.com. The family invites family and friends to share memories, conversation and refreshments in the church hall following the service, Tuesday. We encourage you to share your most beloved memories of Daniel G. Spellman here, so that the family and other loved ones can always see it. You can upload cherished photographs, or share your favorite stories, and can even comment on those shared by others. Provide comfort for the family of Daniel G. Spellman by sending flowers. I am very sorry for the loss of your dear Daniel. May the memories you shared with him bring you comfort during this difficult time. Consideration of God’s word has helped comfort many people worldwide. John 5:28,29 highlights God’s promise for us to see our loved ones again.